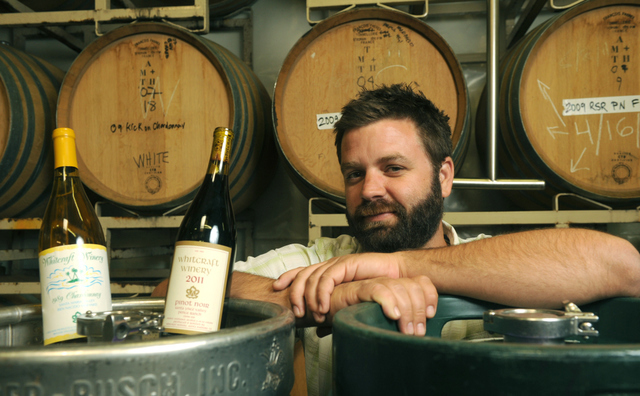 In the late 1980s, around the time that Drake Whitcraft was learning how to ride a skateboard, Santa Barbara County vintners were finally starting to embrace and employ sophisticated grape-growing and winemaking techniques. At the heart of that maturation, which carried on into the 1990s and continues sharpening even today, was Drake’s dad, Chris Whitcraft, a wine-retailer-turned-maker who started making chardonnay in 1985 and, in 1992, became the first in California to designate a vineyard block on his labels (Q Block from Bien Nacido, scored at 96 points by Wine Spectator). In 2007, Drake took the winemaking reins from his dad, and today, the 31-year-old looks at the industry’s evolution through a unique lens, simultaneously proud of his father’s role yet discerning of how the region’s older wines are ageing 10, 20, and even 30 years later. “I’ve been very pleasantly surprised with my dad’s wines,” said Whitcraft while sipping on a pinot noir that Chris made in 1999 from Hirsch Vineyard in Sonoma. “This is still very alive. The fruit isn’t dead or dusty. It’s still intact structurally.” The same could be said for Whitcraft Winery’s older chardonnays, including a 1989 that was opened during a wine-club party last October, the large catalogue of pinots from both Santa Barbara and Sonoma vineyards, even a recently popped 2002 lagrein (an inky varietal originally from northern Italy), which Drake rightfully described as similar to “black cherry pop.” He credits the longevity to his dad’s preference for higher-acid wines, ones that tend to be picked a tad earlier instead of waiting for ripeness to reach too-sweet levels. “If there’s no acid in a wine, it’s not gonna age,” said Drake. Though once peaking at 3,200 cases a year, Drake scaled back dramatically in his first years and has been slowly building up production as the growth of his wine-club demands. In 2012, he made just 800 cases, but he plans to release about 1,000 cases this year. In the usual mix are chardonnays from two vineyards, pinot from four, including one in Oregon, a syrah, and, to be released in 2015, a brut rosé sparkling wine that he’s making with pinot from Morning Dew Ranch in Anderson Valley. He also makes a carignan-grenache blend for a master sommelier under the Jadis brand. But, aside from drinking copious amounts of highly hopped craft beer, exploring the older wines in his family’s portfolio remains one of Drake’s favorite hobbies, and he plans to bust out a couple special bottles on June 29 during the Santa Barbara Wine Festival at the Museum of Natural History. Many other winemakers also do the same during that event, which is the region’s longest-running and arguably tastiest wine fest, featuring a meticulously curated collection of winemakers and food purveyors. “I do that there because it’s the oldest wine festival and it has the most knowledgeable tasters of any festival,” said Whitcraft, who often gets people at his booth who remember his dad pouring the particular wines when they were first released. “People seem to appreciate them more than at any other tasting.” But beware: While they’ve taken a couple decades to blossom, they tend to disappear in mere minutes. The Santa Barbara Wine Festival at the Museum of Natural History is on Saturday, June 29, 2-5 p.m. See sbnature.org. Visit Whitcraft Winery at 36-A South Calle César Chávez, call (805) 730-1680, or see whitcraftwinery.com.